Barrel assembly have dents on side of them due to when the manufacture crimps them. All units are brand new is factory sealed boxes. In the past we have opened every single box, and every single fogger has a dent in the barrel and this is how they make them! All sales are final. These are being sold $3 over our cost, so we are not going to field any phone calls that we have shipped used equipment as this is not the case. All units are brand new. The photo to the right is an example of one of the worse cases we have seen so usually expect a slight depression on one side. Our heavy duty thermal fogger is designed for a variety of commercial applications including: flood and fire restoration, odor control with deodorizers, and insect control. With Barrel Attached: the fogger produces a dry fog. 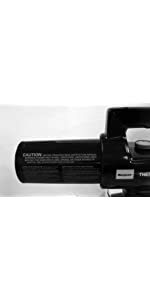 The secret to the success of the Burgess 16982150 Electric Thermal Fogger lies in its ability to produce microscopic particles that spread and penetrate any area being treated. 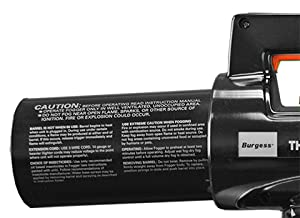 With Barrel Removed: the model 982 turns into a 2 ounce per minute, all-purpose electric applicator for applying water-based or oil-based material. Effectively controls flying insects with oil-based insecticides or odors caused by fire, smoke, pets, mildew, etc. with oil-based deodorant. Can convert 1 ounce of oil-based insecticide into 2,000 cu. ft. of fog in just 2 minutes. Heating element atomizes chemical into fine particles allowing it to float under and around surfaces for complete coverage. The flow rate can be adjusted based on the application for a wetter or dryer fog. Heavy duty reservoir holding up to 96 ounce of oil- or water-based solutions. With fogger unplugged, inspect nozzle cap by pulling barrel away from fogger body as shown. Inspect nozzle for accumulation of any foreign matter. Clean nozzle if needed before using and secure nozzle tightly. Attach barrel by positioning the prongs directly in line with the slots provided for them in the housing. Push the barrel firmly into place being careful not to twist or bend the prongs. Barrel should snap into place. Do not leave any gap between fogger body and barrel as shown. 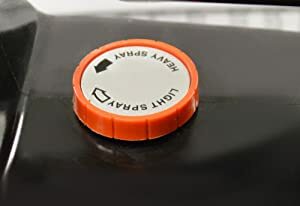 After filling container with (oil based) chemical, be sure latches are fastened securely to lid as shown. Poor Fog Quality 1) Low voltage or 2) Incorrect extension cord 1) Change to another power source. 2) Extension cords must be 3-wire, 10, 12 or 14 gauge. Lighter cords may result in insufficient heating and insecticide leakage from end of barrel. Chemical Dripping 1) Nozzle loose, 2) Excessive chemical output, 3) Worn out barrel assembly, or 4) Other (see poor fog quality) 1) Tighten nozzle securely. 2) Adjust to drier output. 3) Replace with factory replacement assembly only. 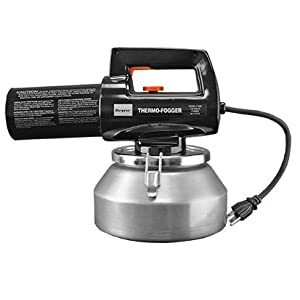 No Fog or Spray (Unit Vibrates) 1) Nozzle obstructed, 2) Pump plugged, or 3) No power at plug 1) Remove and clean nozzle with sharpened wooden toothpick (do not use metal object). 2) Insert wooden toothpick into hole at bottom of pump and pick out foreign material. 3) Check electrical connections, fuse, and extension cord. No Fog, Sprays 1) Worn-out barrel assembly or 2) Using water-based insecticide Replace with factory replacement assembly only. 1. 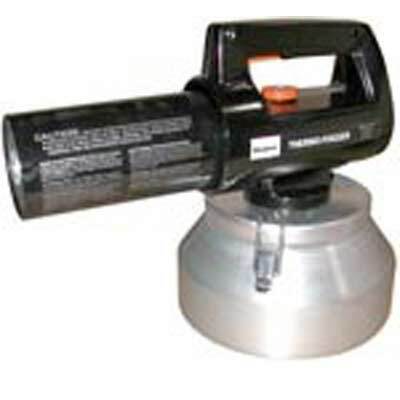 Allow the Burgess 16982150 Electric Thermal Fogger to pre-heat for two minutes or more. 2. Carry the fogger as you would a suitcase, holding it about 3 feet off the ground and away from your side. 3. Pull the trigger, conveniently located on the underside of the handle, to start the unit operating. Release trigger to stop. 4. Turn adjustment knob clockwise to obtain a dry fog. With a dry fog, you should see no moisture on a 8 inch x 12 inch minimum piece of paper or cardboard when you pass it through the fog about a foot from the barrel. Be careful not to place hand in front of the barrel. 5. 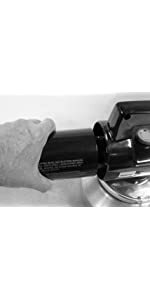 For continuous use (more than 1 minute), be sure the unit is adjusted for a dry fog or liquid will drip from end of barrel. Note: The fogger should only be operated indoors by certified, trained Fire and Smoke Restoration Technicians and certified, trained Odor Control Technicians and only in accordance with the IICRC (FSRT) Fire & Smoke Restoration Technicians and Odor Control Technicians (OCT) guidelines and standards. The Burgess 982 Fogger is a commercial-grade fogger ideal for flood and fire recovery and eliminating pet or mildew odor. Can also be used as a highly effective pest control fogger. The same effective system used by professionals to kill mosquitoes. 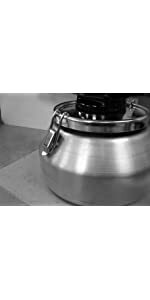 Removing heating element converts it to a low volume sprayer/mister. For thermal fogging only use products formulated specifically for thermal fogging - oil or water-based solutions containing propylene glycol oils. These products are flammable and only certified professionals should use them. Always follow chemical manufacturer instructions, warnings and safety guidelines. Refer to SDS for proper use instructions and to verify compatibility with thermal fogging. For low volume spraying (heating element detached): water-based and light oils may be used. Heavy oils and other thick fluids will not work in this spraying mode. Do not use wettable powders in the fogger as they will damage unit and clog nozzle components. To get the most from your fogger use a dry fog - the dryer the fog, the smaller the particles. 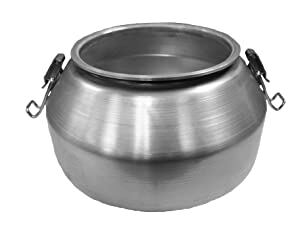 Fog dryness is controlled by chemical flow rate through heating chamber, which is controlled by turning adjustment knob clockwise (counterclockwise for wetter fog). Wet fog deposits film or residue, which may be desired on trashcans, pavement, or building foundations. Never use wet fog on plants, shrubs or carpeting. The oily residue could have damaging effects. Keep fogger 10 feet away from area being treated and let fog drift in desired direction. At this distance, any non-vaporized particles will settle to the ground. 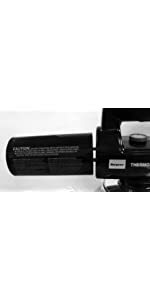 Steambrite will ship the Burgess Model 982 Electric Hot Thermal Professional Fogger 115 volts AS42 FREE Shipping [AS42] by either Fedex, UPS, USPS, or Freight Quote,, and will normally be shipped within 2-5 business days. Equipment small enough to be sent by ground should typically arrive within 3-5 business days after shipment. Large Equipment could take in excess of 6-8 working days to arrive after shipment, and ground shipping times are not guaranteed. This product was added to our store on Monday 17 November, 2008. 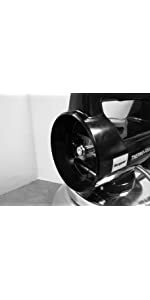 Nikro 860258: Inflatable Zone Bag for Duct Cleaning 26in.